Most homebuilders don’t give much, if any, thought to closet organizers. The typical closet is composed of little more than a closet rod and a single shelf. That’s somewhat like having bathrooms that contain tubs but no showers. Yes, we could all get clean, but not nearly as easily or quickly. The conventional closet uses about half of the available storage space, and it is also hard for many to access conveniently. Shoes are piled on the floor, requiring that we bend down to sort through the selection in the dark. Top shelves are often filled with layers of stuff that is both hard to see and difficult to reach. That’s why there is such a market for professional closet organizers and for closet systems that can be installed by do-it-yourselfers. 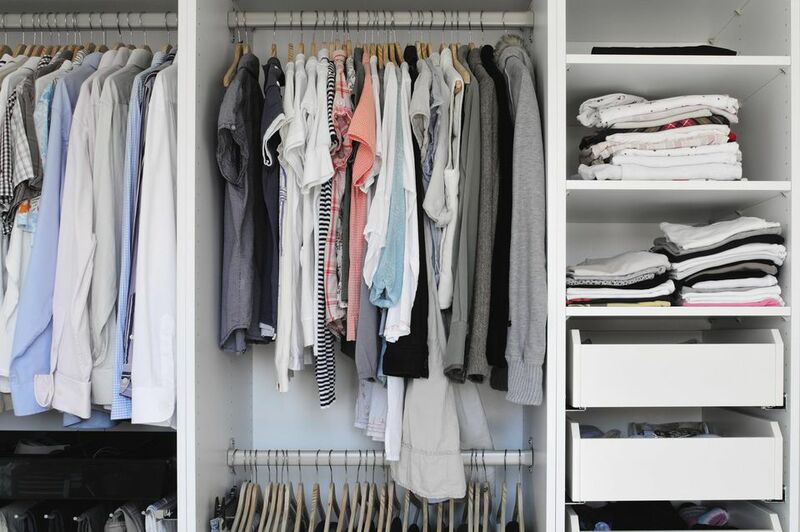 If you have a closet that is usually a mess, and that you suspect holds stuff that has been long missing, now is the time to do something about it. A good closet organizer can do more than tidy up the closet. Equipped with the proper components, it can eliminate the need for bulky dressers and other cabinets in a bedroom or other part of the house. If you are in the process of buying furniture, I suggest that you first maximize the potential in your closets, then take a serious look at what other storage units you really need. Here are some of the options available regarding installation techniques and materials in closet organizers. Closet organizers can be entirely freestanding or entirely hung from the wall, but many are a bit of both. Drawer units can be set on the floor, with shelves and hanging rods attached to wall-mounted standards. The popular Elfa system sold by the Container Store and various systems made by Schulte are good examples of this kind of hybrid system. Some wall-hung systems do not have to be attached to studs, but you will be able to support heavier loads with fewer problems if the hardware is fastened to studs. Some have vertical rails attached high on the wall from which the various components can be hung, while others rely on vertical standards connected to the wall. Ikea offers the modular Stolmen system, which can be mounted very easily to the wall or ceiling. This system is really quite portable, so you can take it apart and move it as the need arises. EasyClosets and Closets To Go are online sources for several styles of closet organizers. The sites offer you the chance to design your own system, or you can send them the relevant dimensions and let them design one for you. Wire systems are generally the least expensive, and they are also the easiest option for DIY installation. Home centers and other retail outlets carry entire systems that are based on stand-alone components as well as rods and shelves that are attached to wall-hung brackets. With so many components, it is easy to customize a closet organizer that fits your needs to a tee. The open mesh of the drawers and shelves is nice for circulation and visibility, but small items can fall through. Shelf liners can remedy that problem. The closet organizers mentioned above are available with wire mesh options. ClosetMaid is a basic DIY closet system available at Lowe’s, Home Depot and online. It is low-cost and easy to install and customize. It won’t win any awards for great looks, but since it will often spend most of its time behind closed doors, you may not care. Melamine is composed of resin (usually white) applied over particleboard. Look for thermally fused melamine over 3/4-inch particleboard, which is the material of choice for closet specialists. Home centers often carry cold-pressed melamine, which is less durable, applied to 5/8-inch particleboard, which is not as strong. Melamine closets are affordable and easy to clean. Many people don’t like that ultra-sanitized appearance of the white surface, but others are comfortable using it in their kitchen cabinets. Solid wood might be the best choice for a well-lit walk-in closet, where appearance is more important than it would be in a small closet. But using solid wood will cost several times more than melamine or wire. Given that most closets are closed and dark most of the time, many consumers conclude that their money is better spent elsewhere. If you like the appearance or solid wood, but can’t handle the expense, consider using wood-grained melamine. This material is often used on low-cost office equipment, and in a closet, it may well be difficult to distinguish it from the real thing. Most of the DIY shelving systems offer design assistance, either online or, in the case of Elfa, at the Container Store. Once you are satisfied with a layout and its components, you can install it yourself, following the supplied instructions. Installation usually requires little more than a cordless drill and a few hand tools. Some companies will direct you to a professional installer. As carpentry projects go, building a closet system is not particularly difficult. For those more interested in doing the work themselves, good sources for racks, hooks, shelves and other components include Rockler, Lee Valley Tools and KitchenSource.com. If you would rather leave the design and installation work to a professional, there are two ways to go about it. The first is to hire a general handyman or carpenter to build what you want. The second is to hire a professional closet consultant to handle the whole process. California Closets is a well-regarded and widely advertised franchise that delivers soup-to-nuts closets. You may find similar businesses in your local area. For best results, I recommend that you compare quotes from both a carpenter and the closet professional before making a final decision.